...and, in my opinion, none of them were considered turkeys. This random selection of sightings starts on November 20 with NS 64J taking the Royce Running track (LEHL MP 40) as it prepares to work the BRI facility in Bridgewater. Motive power was NS 9482 followed by NS 8705 and NS 9198 on this day. 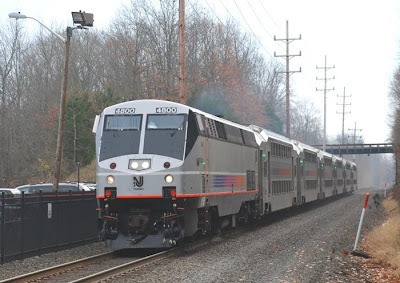 NJT 4800 (ex-Amtrak 812; GE P40DC) is the leader for NJT train 5719 as it pulls into NJT's Raritan Valley Line (RVL) North Branch station on November 23 on time at 11:07. It has quite a newsworthy past. NJT 4800 served as one of the two engines on that initial southbound revenue run of ACES (Atlantic City Express Service) on February 6, 2009. On the February 12, 2010 ACES run, 4800 caught fire while running on the NEC in Falls Township (PA). The fire brought down an estimated quarter-mile of overhead catenary. This caused all train service between Wilmington DE and Trenton NJ on the NEC to be shut down for 2 hours as a result. Next up is NS 20E, with NS 7610, NS 9970 and NS 9676, seen passing through the Main Street grade crossing in Three Bridges, NJ (LEHL; MP48) at 8:30 on November 24. Received the following via email on Monday, 11/22/10, from Norfolk Southern. Some shipments normally moving on the line between Macon and Savannah, Georgia, are being rerouted due to a derailment at Midville, Georgia, and may encounter delays of 24 to 48 hours. Customers with questions regarding specific shipments should contact the National Customer Service Center. corner N. Washington Ave. & Front St.
It’s FREE and Everyone is Invited!!! 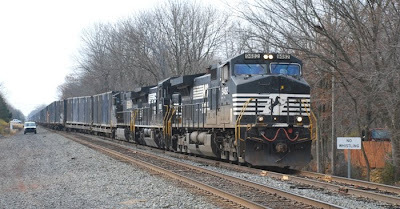 NORFOLK, VA. - Donald W. Seale, executive vice president and chief marketing officer for Norfolk Southern Corporation, will address the RBC Capital Markets' Transportation and Industrials Conference in Miami, Fla., at 8:30 a.m. EST on Wednesday, Dec. 1, 2010. Interested investors can listen via simultaneous webcast at http://www.wsw.com/webcast/rbc127/nsc/. After the webcast, the presentation will be posted at www.nscorp.com. NORFOLK, VA. -- Norfolk Southern Corporation has been named one of the nation's best employers for people with military experience. G.I. Jobs magazine ranked Norfolk Southern among the top 20 companies in its America's Top 100 "Military Friendly Employers" list for 2011. The annual list recognizes companies that have made the greatest effort and had the greatest success in hiring military veterans, and that have the best policies for employees serving in the National Guard and Reserve who are called to active duty. 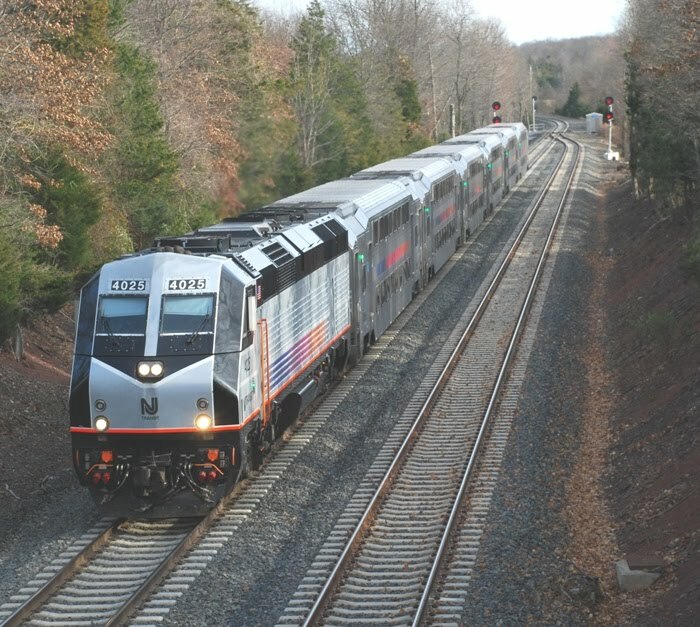 Norfolk Southern ranked 19th on the list. This is the sixth time Norfolk Southern has earned a spot on the list. Norfolk Southern actively recruits people with military backgrounds for careers in railroad operations and management. During 2010, NS has recruited more than 270 veterans as new hires, 12 percent of all new employees. "Military veterans bring valuable professional and technical skills to the workplace as well as an exceptional work ethic, leadership, experience, and a team-oriented attitude that are an excellent match for a career in the rail industry," said Cindy Earhart, NS vice president human resources. A complete list of the Top 100 Military Friendly Employers is available on the G.I. Jobs Web site, http://www.gijobs.com/2011Top100.aspx?start=1&year=2011. To learn more about careers with Norfolk Southern, go to www.nscorp.com. Three model-train enthusiasts are organizing a holiday train display that will take place at the Milltown Senior Citizen Center on Nov. 13-14. The show will feature numerous operating toy-train layouts and more than 100 static displays of trains and accessories, as well as artifacts from the Raritan River Railroad. There will be several presentations, including "The Evolution of Toy Trains," "The History of the Raritan River Railroad" and "A Day in the Life of the Raritan River Railroad," as told by former engineer and fourth-generation railroader Kenneth Stockton. 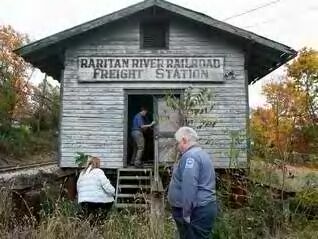 The event is a fundraiser during which the Milltown Historical Society and the future Raritan River chapter of the National Railway Historical Society hope to raise money to move the Raritan River Railroad Freight Station, located near the tracks on Washington Avenue, to county-owned land across the street. Here James Curren (top, center) owner of the property the station sits on opens up the building for Milltown Historical Society member Kathy Heilman (center) and local historian James Reid (right). The 2010 Regional Center Summit is free. Pre-registration is requested and may be accomplished online at info@regionalcenterpartnership.org or by calling Jim Ruggieri at 908-231-7021. From the Star-Ledger for Monday, 11-1-10. A pedestrian was struck and killed by a train this evening in Hillsborough (NJ), according to a spokesman for rail company CSX Transportation. Authorities have not yet released the identity of the victim, who was struck near Homestead Road by a commercial train traveling from South Kearny to Philadelphia, said spokesman Gary Sease. The collision was reported shortly before 6 p.m., he said. Note: Homestead Road crosses the CSX Trenton Line on a highway bridge, not a grade crossing. First, along the LEHL NS 11J is approaching Hillsborough's Valley Road grade crossing (MP 40) at 9:13 on this cloudy morning. Leader 8384 is ex-CR 6171 followed by NS 9235 and 57 autoracks. Next stop is Belle Mead where CSX 439, with leader CSX 778, passes beneath the Route 206 bridge that is scheduled to be replaced. 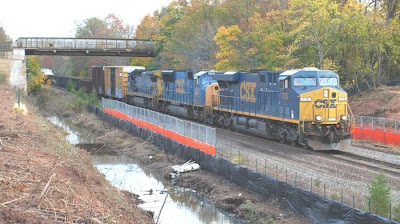 Work to replace the Route 206 overpass in Belle Mead (NJ) over CSX's Trenton Line has begun as evidenced by the clearing of the surrounding area. This project will demolish the existing 85-foot single-span bridge and replaced it with a new 138-foot single-span structure 200 feet south of the current bridge. A sidewalk in each direction will be included on the new span. The clearing of the trees has provided a photo location, albeit a temporary one, along a line that does not have many photo locations due to the trees adjacent to the ROW. This project also proposed to “Keep the historic element of the Delaware and Bound Brook Railroad Historic District and Belle Meade Railroad Station by designing the replacement bridge with the same characteristics of the existing bridge”.